Here at Mortech, we’re not just focused on providing you with all the tools you need within our mortgage pricing engine, Marksman®. We also pride ourselves in being mortgage experts who are constantly monitoring the business and providing easy access to mortgage loan products that you can supply your customers with accordingly. We want to help our customers provide a wide variety of mortgage loan products across multiple investors to their borrowers, quickly and easily. This week we pulled some data from within Marksman on a few different loan products, and compared their quote volume with their more widely quoted counterparts over the last six months. We took a look at the number of quotes per product and compared it to the amount of Marksman users that have those specific products enabled for their Loan Officers to quote in their Marksman system. 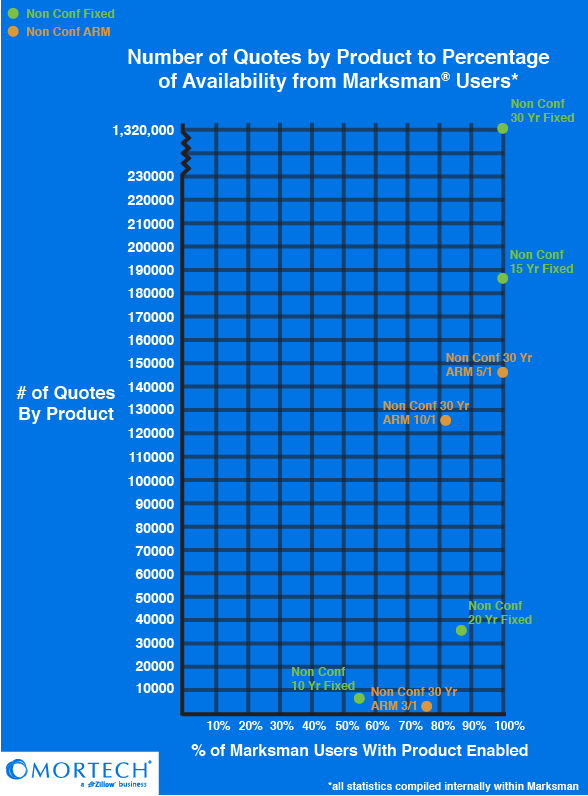 What we found was that the more niche a product becomes, the less it gets used, and that loans that are similar to some of the most quoted loans in Marksman are enabled by fewer users, and thusly, see a vast difference in the number of quotes per product. Non-Conforming 15 and 30-year fixed-rate loans were by far the most enabled and quoted products within Marksman. However, their 10 and 20-year counterparts were enabled by less Marksman users, and as a result, were quoted far less. The same goes with the Non-Conforming 10/1 and 3/1 ARM loans, which saw significantly less quotes due in part to significantly less usage from Marksman users. One possibility as to why these loans aren’t being quoted as often as their more popular counterparts is due to a perception that they would be less likely to price successfully. However, Non-Conforming 10-year fixed-rate loans had a slightly higher return success rate than its 15-year counterpart*, and the 20-year option successfully priced at a higher percentage than either the 15 or 30-Year options. The same can be said of the Non-Conforming 10/1 ARM, which was more successfully returned than the 5/1 option. This is despite less availability from Marksman users, which is primarily due to these products not being enabled by Marksman users, either because they currently don’t offer them, or simply haven’t turned them on in their system. We know that our customers trust us to provide them with the best tools for their business and their borrowers. But we also want our customers to trust that all of the products we put into Marksman can be used to help provide better loans and create happier borrowers. To find out more about the tools we can provide you schedule a free, consultative demo today.